This forced me to think about a pretty fundamental question: what do we want from a health care system? What does an ideal health care system look like? I would argue that most people want a health care system where they can get timely access to high-quality, affordable care and one that also promotes innovation of new tests and treatments. But underlying these sentiments are a lot of important issues that need unpacking. First, what does it mean to be able to access care when you need it? A simple way to think about this is being able to see a doctor (or other health care professional) quickly and easily, and in cases where there are follow-on tests, procedures, and treatments, you can get them without much delay. This brings up one important point: while experts often discount the importance of timeliness, regular people generally don’t: anyone who has waited weeks or months for a follow-up after an abnormal test result or to get a needed surgery knows that waiting times are not just an inconvenience. Delayed access can be stressful, agonizing and in some instances, downright harmful. Beyond access, of course, we want care we can afford. Almost all of us need some sort of insurance that would pay for an unexpected, catastrophic health care expense (like spending a few weeks in an ICU). Most of us need some sort of financial coverage for other, slightly less expensive services such as an MRI or a knee replacement. And even still, some of us will struggle to pay for simpler things like doctors’ visits and need financial help there as well. There is broad consensus that we want a health care system where people aren’t denied the services they need because they can’t afford them. While accessibility, timeliness, and affordability are key, there are other aspects of care that get less attention but are just as important: we want care that is safe and effective and produces the best outcomes possible. It’s great if you can have timely cardiac surgery and pay little or nothing out of pocket. But if you die unnecessarily from a preventable error, you didn’t get what you needed from the health care system. Finally, we want a health care system that creates new knowledge so that we get better at caring for sick people. One of my earliest memories of medical school was caring for a young woman, an artist with two small children, who died of a complication of chronic myelogenous leukemia after a bone marrow transplant. Today, her disease could have been managed by a simple, daily pill that has turned CML into a chronic, yet manageable disease. A system that generates new therapies that save lives is critical, and its importance is often overlooked when assessing health system performance. So what is the ideal way to organize a health care system to accomplish these goals? One school of thought believes that market-based systems are the solution because they rely on competition, customize care for individuals, keep prices down, and allow the highest quality providers to flourish. For others, the answer is a government-run, single-payer system where everyone has equal access, gets comparable quality, and patients don’t have to worry about costs because the government takes care of it. 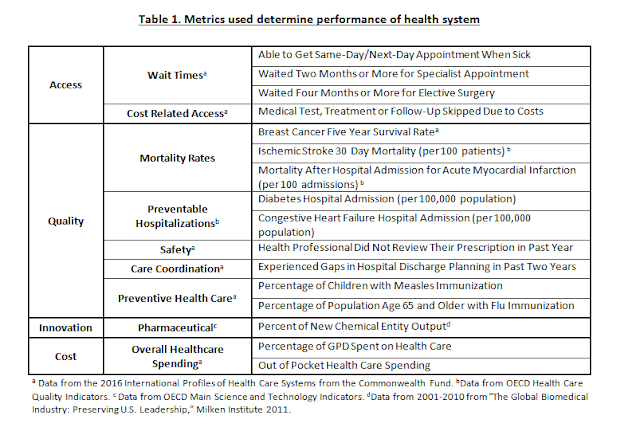 While either approach can be supported with selected data and facts, as I have looked at health systems from around the globe, one theme becomes obvious: systems organized very differently can achieve comparable levels of performance, and no single approach consistently outperforms others. So which countries have the best systems? As the Upshot piece outlines, we did a tournament-style competition where in each round, we had to pick winners and losers. At the end, we were also asked to rank the selected 8 countries based on our overall assessment. To do so, my approach was simple. Health systems should be judged not by how they are organized (i.e., markets or government) but what they produce. 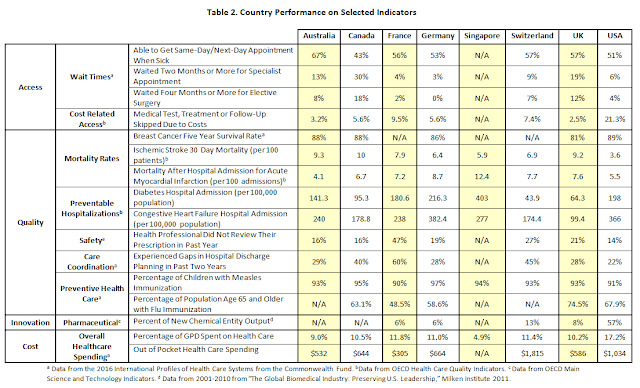 How well does it do what a health care system ought to do? So that’s the approach I took. That leads us to the next question: What metrics should we use? If you made it to the first day of a health policy 101 class, you learned about two metrics: per capita spending and life expectancy. If you made it to the second class, you learned that unfortunately, these are far too crude to tell you much about health system performance and do not help generate an actionable set of policy prescriptions. Health care spending is driven by many factors, including what is encompassed in spending calculations (research and development? medical education?) 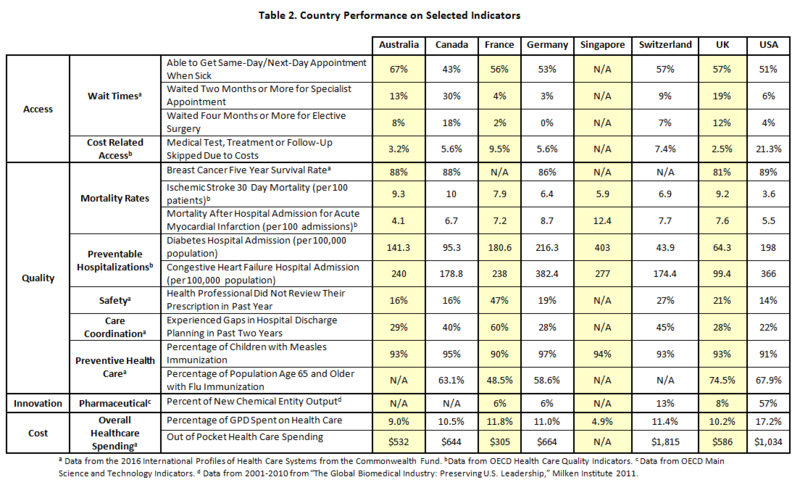 and prices (if one country pays its nurses half as much as another — does that mean the first is twice as efficient?). Life expectancy is even more complicated as it is driven in large part by behavior, lifestyle, and genetics of the underlying population. As Irene Papanicolas and I point out in our recent JAMA piece, drawing these boundaries when comparing health care systems is important. So if we can’t just look at those metrics, what else should we examine? While one could evaluate literally hundreds of metrics, I prioritized 16 (see Table 1). None of these are perfect, but they seemed reasonable to me – a few on access, quality, cost, and innovation. Ultimately, I was interested in assessing performance in areas that are clearly within the purview of the health are system – how many people are covered and covered for what? How quickly can you see someone when you’re sick? How good is the system at taking care of you when something terrible happens, like you have a stroke or a heart attack? Does the system generate lots of innovation so that everyone’s care gets better over the time? I tried not to overly weigh any one of these but tried to look at them holistically. A few caveats. First, these are all very good health care systems — and we’re generally comparing systems that are far superior to much of the rest of the world. Second, there was rarely a clear winner in head to head competitions. Switzerland and Germany both have excellent systems, and reasonable people could draw a different conclusion from the same data. I struggled among the U.S., France, Australia, and the U.K., all of which had clear strengths and clear challenges. Singapore lagged behind in large part because there is so little data about their performance and lack of data means it might be better than it looks, or it could be worse. I just don’t know. The ranking of the U.S. above places like France and the U.K. may be surprising. Some people will point, rightly, to the fact that the U.S. has the highest spending in the world yet still has people who are uninsured. The health care spending problem of the U.S. is largely a political choice; we have extraordinarily high prices on everything from physician salaries to pharmaceuticals. While some of these high prices may spur innovation (i.e., pharmaceuticals), the cost of spending nearly 20 percent of our GDP on health care means less money for everything else. We could do better with different policy choices. On the issue of universal coverage, things are a bit more complicated. While it’s narrowly true that the U.S. is the only country here without universal coverage, it’s too simplistic. First, 91 percent of Americans are now insured (thanks in part to the ACA). Some countries have universal coverage for their citizens but not necessarily for immigrants or other groups. Second, it is important to consider what is actually covered. While most Americans can get access to the latest treatments, in many countries, access to the most expensive therapies can be difficult or non-existent. I don’t know if we will get to 100 percent coverage but we are inching towards it, and I hope that with the next set of policy reforms, we can get into the high 90s. And that would be good. Finally, if you take a big step back and look at the data, Americans do better than average in timely access, especially to specialty services and “elective” surgery (which is often not that elective). They tend to be among the leaders in acute care quality, when health care means the difference between life and death, although the quality of primary care could surely be better. And America is the innovation engine of the world, pumping out new drugs and treatments that benefit the whole world. All of that earns America a high rank in my book — behind Switzerland and Germany but ahead of others. You can disagree, but overall, while the U.S. health care system has a lot of work ahead, we should not overlook its strengths – and they are sizeable. 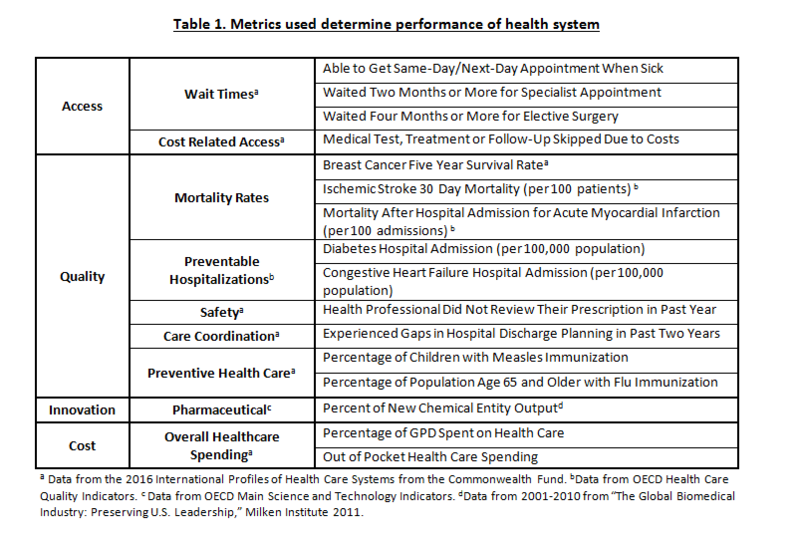 So here’s the big picture: when it comes time to measure health system performance, it’s important to think about boundaries (what is the responsibility of the health care system and what isn’t). It’s also important to consider whether the system is delivering what people need: coverage of a broad range of services, especially those that are important for the sickest among us, timely access to affordable, high-quality care, and innovation that ensures care gets better over time. For most people, whether the system is market-based or government-run matters a lot less than whether it’s meeting their needs. And that’s the way it should be.